The adult mammalian ventricular myocyte is considered incapable of repairing local injuries, and a connective tissue scar forms at the site of injury (MCMinn 1969; Fanburg 1970; Bing 1971; Rumyantsev 1977, 1981). 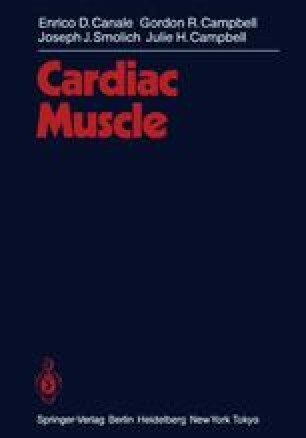 This loss of regenerative ability is due to an irreversible withdrawal of the cardiac myocyte from the cell cycle (Ingwall 1980) and the fact there are no satellite cells present as in skeletal muscle (Rumyantsev 1979; Campion 1985). Cardiac muscle of developing animals can however divide but appears to require some loss of Z-disc material and myofibrillar disintegration (Oberpriller and Oberpriller 1971; Rumyantsev 1972; Erokhina and Rumyantsev 1983). Whether or not cells are capable of division appears related to their degree of differentiation or development of specialized characteristics. Maximum incorporation of 3H-thymidine into DNA after injury to the ventricle occurs in the one-week animal (8%), with incorporation of 3.2, 2.2 and 0.2% in the 2−, 3− and 4-weekold animals respectively (Nag et al. 1983 a). Mammalian atrial muscle (in which there are a number of less specialized cells) does show some DNA synthesis and mitosis after infarction of the left ventricle (Rumyantsev 1974), however direct damage again fills with scar tissue as a result of overgrowth of proliferating nonmuscle cells (Rumyantsev 1982). In contrast to the mammalian heart, the myocytes of lower vertebrates, such as amphibians and reptiles, possess a higher capacity for regeneration (Oberpriller and Oberpriller 1974; RuMyantsev 1977; Bader and Oberpriller 1979; Mcdonnell and Oberpriller 1983) but even here direct wounding leads to scar formation (McDonnell and Oberpriller 1984).